Is it possible that we participated in one the most engaging, super fun, sensory art activities for toddlers ever to exist? I think so! Held at one of our favourite Melbourne spots, ArtPlay, I was very excited to finally be attending a Paint What You Hear workshop directed by musician Erica Rasmussen and visual artist Zakiya Kurdi. These amazing workshops use classical and contemporary music and visual art to engage young people and adults in the arts, inviting them to respond to live music using paint. 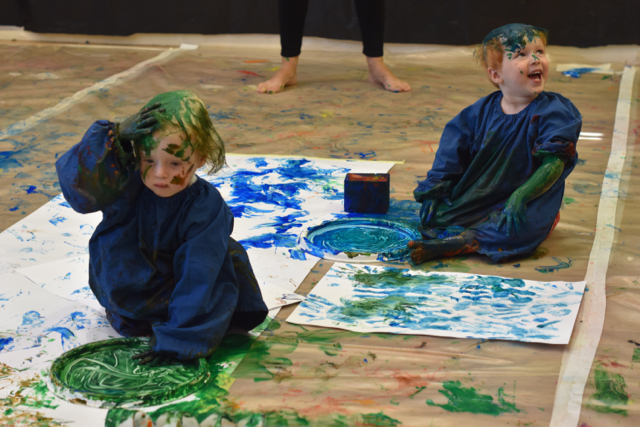 Prompted by a very thoughtful email from the wonderful front of house team at ArtPlay, it was fortunate that we were wearing old clothes as the poppets definitely enjoyed their morning of tactile exploration of sound and paint. Lots and LOTS of paint! 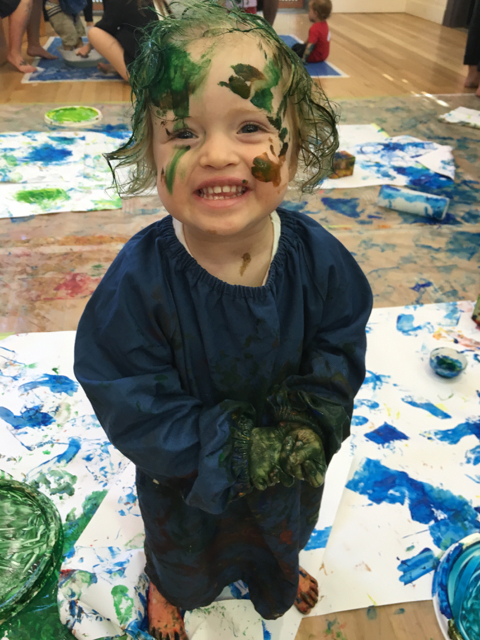 Throughout the workshop (created especially for toddlers) Erica played a variety of percussion instruments and encouraged the little ones to respond to all sorts of sounds using movement and paint to create spontaneous visual artworks. Zakiya moved around the two workshop spaces demonstrating and interacting with the children and introducing different objects for them to explore with including plastic bottles filled with various liquids and sensory objects as well as larges sponges. The poppets certainly embraced the freedom that Erica and Zakiya give the children in their workshops; by the end of the session not only were they completely covered in paint from head to toe but they had spent the full 45 minutes engaging and interacting in the space around them, in their own unique and individual way. Sure messy play can be ‘messy’ but I absolutely love watching Arlo and Macy make a mess because I know the benefits of messy play far outweigh the necessary clean-up. 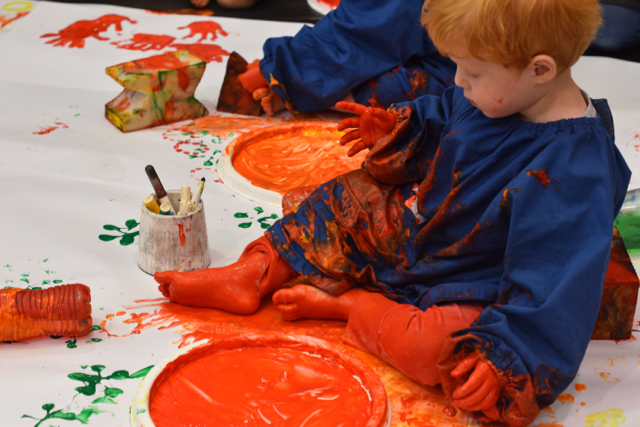 If you love the idea of letting your little one directing the learning opportunity then be sure to keep an eye out for the next series of Paint What You Hear workshops being announced via their website and of course we highly recommend that you visit ArtPlay and experience one of their unique and engaging events for yourself. For more information about Artplay, head to their website and make sure you sign up to their newsletter to keep up-to-date with upcoming events and workshops.